"Asked for a conservative estimate of the monetary payoff from coaching they got, these managers described an average return of more than $100,000, or about six times what the coaching cost them." A 2001 study on the impact of executive coaching by Manchester Inc. showed an average ROI of 5.7 times the initial investment or a return of more than $100,000 - according to executives who estimated the monetary value of the results achieved through coaching*. *The respondents were executives from large (mostly FORTUNE 1,000) companies who had participated in either "change oriented" coaching, aimed at improving certain behaviors or skills, or "growth oriented" coaching, designed to sharpen overall job performance. The programs lasted from six months to a year. About 60% of the executives were ages 40 to 49--a prime age bracket for career retooling. Half held positions of vice president or higher and a third earned $200,000 or more per year. 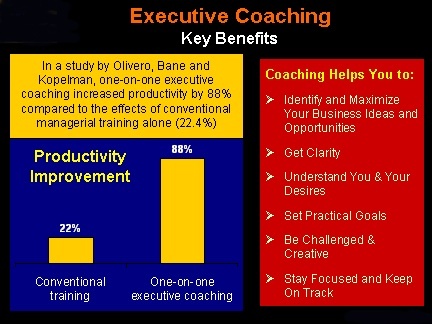 A 2001 study MetrixGlobal to determine the business benefits and return on investment of for an executive coaching program, found that "coaching produced a 529% return on investment and significant intangible benefits to the business, including the financial benefits from employee retention boosted the overall ROI to 788%." In an article in Harvard Business Review, authors Rucci, Kim, and Quinn, discuss how coaching contributed to the turnaround of Sears …"In their "turnaround" effort, the company's mission was to have Sears be a "compelling place to work, a compelling place to shop, and compelling place to invest." They set up rigorous measurements for (among other things) employee attitude and satisfaction. One of their primary questions was "How does the way you are treated by those who supervise you influence your overall attitude about your job?" Their statistics showed that consistently as the quality of management improved, so did employee attitudes, and then customer satisfaction. The numbers showed that "a 5 point improvement in employee attitudes will drive a 1.3 point improvement in customer satisfaction, which in turn will drive a 0.5% improvement in revenue growth." In a billion dollar company, 0.5% increase in revenue is substantial. Sears learned that when their managers fully value and develop their employees (i.e., using the coach approach), they could confidently predict future revenue growth in a particular district. When employee satisfaction increased 5%, revenue growth in a particular store increased by 5.5%." "Many of the World's most admired corporations, from GE to Goldman Sachs, invest in coaching. Annual spending on coaching in the US is estimated at roughtly $1 Billion Dollars." "In one study, executive coaching at Booz Allen Hamilton returned $7.90 for every $1 the firm spent on coaching." "I'll bet most of the companies that are in life-or-death battles got into that kind of trouble because they didn't pay enough attention to developing their leaders." Wayne Calloway, former Chairman, Pepsico, Inc.
"In research conducted over the past three years we've found that leaders who have the best coaching skills have better business results." "The business demand for coaching is nearly doubling each year. Out of the $80 billion being currently spent on corporate education, FLI Research estimates that $2 billion is spent on executive coaching at senior executive levels in Fortune 500 companies." "We have done lots of research over the past three years, and we have found that leaders who have the best coaching skills have better business results." "Personal coaches are a hot commodity among executives these days. Never mind the mansion, the Mercedes, the membership in the exclusive country club. In corporate America today, the sign that you have truly arrived - or at least that you are being groomed for arrival - is an executive coach. Your own personal coach, that is. Even if the coach's assignment is to render you less obnoxious, his or her presence at your elbow signals that you are regarded by the company as entirely too valuable to fire or shoot." "In a recent study, training alone improved leadership skills by 22%. When combined with Executive Coaching, improvement jumps to 77%." "The benefits of coaching appear to win over even the most cynical clients within just a few weeks." "A coach is part advisor, part sounding board, part cheerleader, part manager and part strategist." "Once used to bolster troubled staffers, coaching now is part of the standard leadership development training for elite executives and talented up-and-comers at IBM, Motorola, J.P. Morgan, Chase, and Hewlett Packard. These companies are discreetly giving their best prospects what star athletes have long had: a trusted adviser to help reach their goals." "Strength training provides similar improvements in depression as anti-depressant medications. People who engage in strength training also enjoy improved sleep quality. As with depression, the sleep benefits obtained as a result of strength training are comparable to treatment with medication, but without the side effects or the expense." "Exercise is good for your mind, body, and soul." "Exercise alone provides psychological and physical benefits. However, if you also adopt a strategy that engages your mind while you exercise, you can get a whole host of psychological benefits fairly quickly." "Breathing correctly is the key to better fitness, muscle strength, stamina and athletic endurance."